Editor’s note — Among all types of real estate, only multi-family apartment sales of five or more units remain outside the agency disclosure law but not so for residential leases over one year. The goal of the real estate agency disclosure law is to better inform the public (and licensees) about the duties licensees owe to members of the public. The law was put in place in an effort to eliminate developed misconceptions about licensee duties held by members of the public, also known as principals. 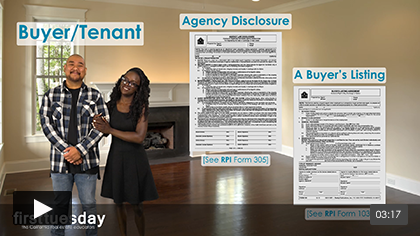 To cover the distinctions in nomenclature between sales and leasing transactions, Realty Publications, Inc. (RPI) publishes two different versions of the agency disclosure form to enhance comprehension. the various agency roles licensees undertake on behalf of their owners, buyers and tenants in a real estate transaction. The second page of the Agency Law Disclosure defines words and explains phrases commonly used as jargon within the real estate industry. the employment relationship between brokers and their agents. A buyer’s agent and seller’s agent are mentioned but not defined. Legally, an agent is a licensed real estate broker. Thus, the word “agent,” when used in the disclosure, is not a reference to the agents of the brokers involved. Instead, “agent” is used to address the broker. Ironically, a broker rarely refers to themselves as an agent, which they legally are when using their license to earn a fee. However, two sections on the face of the Agency Law Disclosure, entitled “seller’s agent” and “buyer’s agent,” address the duties owed to the seller-owner and buyer-tenant in a real estate transaction by these otherwise undefined brokers — buyer’s and seller’s agents. The seller’s broker is correctly noted as being an agent for the seller, and is also known within the trade as a listing broker or listing office. The buyer’s broker is known as a buyer’s agent. However, peculiar to real estate brokerage, the buyer’s broker is also known as the selling agent. One then wonders just who is the “buying agent” — an unmentioned phrase, but one plainly descriptive of the activities undertaken by a broker acting on behalf of the buyer. The buyer’s agent is selling nothing; they are locating property and negotiating to buy suitable property on behalf of their buyer client. These exclusive characterizations of agency conduct have no relationship to employment under exclusive listings to sell or buy property. 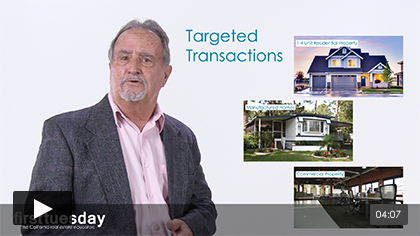 The seller’s agent under an exclusive right-to-sell listing understands the prospective buyer may turn out to be one of their buyer clients. This representation of opposing participants makes the broker a “non-exclusive” dual agent without concern for the exclusive employment of the broker by either the buyer or seller, or both beyond the disclosure of their dual agency. Editor’s note – This article is worded primarily in the context of an agent representing a buyer or seller. However, the same rules of conduct and disclosure apply for an agent of a tenant or landlord. The Agency Law Disclosure states the principles of law governing the conduct of brokers who are acting as agents solely for a seller or a buyer (or tenant or landlord). the general duties owed by each broker to all participants in the transaction, requiring them to be honest and avoid deceitful conduct, known as general duties. Failure of the owner’s agent to provide the owner with the Agency Law Disclosure form prior to entering into the listing agreement for the sale of a property is a violation of real estate law. As a consequence of this up-front failure, the broker stands to lose their fee on a sale if challenged by the owner prior to payment of the fee — closing. The Agency Law Disclosure form is treated by the owner’s agent as a preliminary and compulsory listing associated event. If not made part of the listing agreement by attachment, the broker cannot reasonably expect to enforce collection of their brokerage fee when the property is sold or leased — even after the transaction is in escrow and the brokerage fee has been further agreed to with the tardy delivery of the agency disclosures. For commercial agents, this fatal defect in the initial handling of the fee agreement adversely affects fees on extensions, renewals and later sales of the property to the tenant which are otherwise earned. Further, when the owner’s broker or their agent fails to hand the owner an Agency Law Disclosure form at the listing stage, the listing, and thus the agency, may be cancelled by the owner at any time. Further, payment of the fee may be avoided by the owner even when it has been earned. For the buyer’s or tenant’s broker to protect themselves against loss of their fee due to the failure of the owner’s broker to timely provide the Agency Law Disclosure form, the user’s broker needs to perfect their right to collect their portion of any brokerage fee to be paid by the owner. Here, the share of fees earned by the user’s broker and payable by the owner needs to be agreed to by the owner directly with the user’s broker. This fee arrangement is stated in a boilerplate provision in each LOI, purchase agreement, lease agreement and the escrow instructions used by the buyer’s/tenant’s agent. The seller’s payment of a fee earned by the user’s broker is not enforceable without an Agency Law Disclosure form attached to the initial written negotiations prepared by the user’s broker and signed by the user prior to submission to the owner or the owner’s agent. Click any image below to view the video. Form navigation page published 07-2015. If a potential buyer views a property and the listing agent of that property asks them to sign an agency disclosure form listing them now as a representative for this potential buyer how long is this agreement binding ? If they are no longer interested in the property in question are they still obligated to this agent for future properties? Is this or similar other disclosure required when hiring a property management company ? I am talking to a property management company to help lease & manage our rental property. But they are insisting to sign the “Disclosure Regarding real estate agency relationship” and also stated in the property management contract that if we decided to sell the home to our tenant property management agency will charge 5.7% fee to us. I find this strange. All we want is plain property management contract. is this usual ? Just wondering why on the 2nd page of your Form 305 it states””don’t fill out” in two areas? Thank you for your inquiry! Page two of the Agency Law Disclosure form contains the wording for the agency confirmation provision to be included in targeted transactions. However, the confirmation provision in the Agency Law Disclosure form is not to be filled out and is included for illustrative purposes. The agencies to be confirmed by each broker in the purchase agreement or lease provisions are not known at the time of the initial employment when the Agency Law Disclosure is first presented to the principal. I notice that you only have form 305 which is a general disclosure form for both agents. 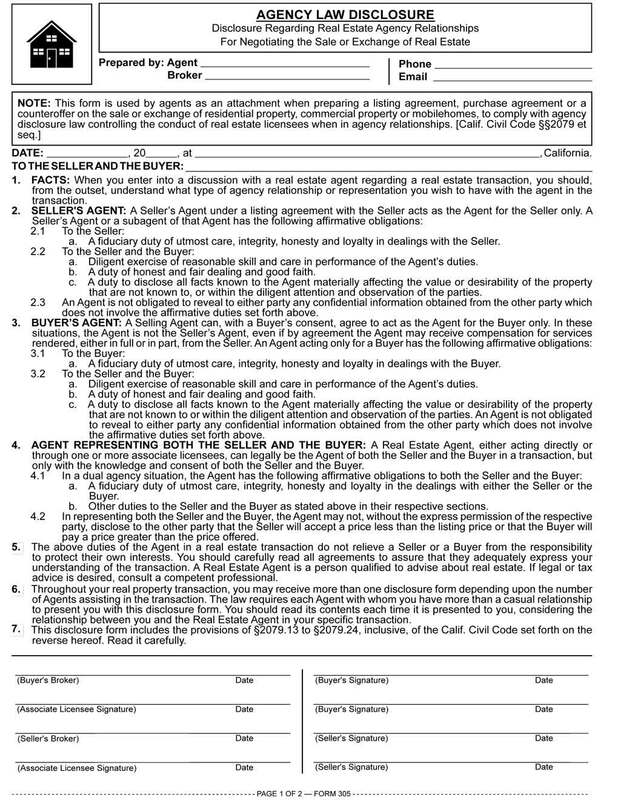 Do you have a separate disclosure regarding RE agency relationship for buyer and buyer’s agent where we check the box for exclusively buyers’ agent? Currently on form 305 there is no box to check our agency relationship with our clients. Thank you for your inquiry! The Agency Law Disclosure [RPI Form 305] is a restatement of preexisting codes and case law on agency relationships of licensees acting on behalf of another person in real estate transactions. The content is statutory. The specific agency relationship of the transaction participants is disclosed in the agency confirmation provision located in all written negotiations to purchase or lease and lease agreements. The agency confirmation provision states the existence or nonexistence of each broker’s fiduciary agency with the various parties in the subject transaction. Each broker identifies the party they are acting on behalf of as their agent in the transaction. You may access all content published by first tuesday regarding the use and application of this form by clicking the collapsible buttons under the image of the form above. For example, the “Related article” button features links to online articles and book chapters that relate to this topic. You would likely be most interested in Agency, Fair Housing, Trust Funds, Ethics and Risk Management: Chapter 3: Agency confirmation provision.